The meaning of architectural sculpture is essential to our understanding of ancient Greek culture. The embellishment of buildings was common for the ancient Greeks, and often provocative. Some ornamental sculpture was placed where, when the building was finished, no mortal eye could view it. And unlike much architectural ornamentation of other cultures, Greek sculpture was often integral to the building, not just as decoration, and could not be removed without affecting the integrity of the building structure. This book is the first comprehensive treatment of the significance of Greek architectural sculpture. 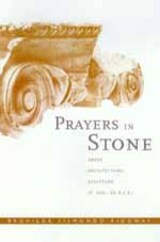 Brunilde Sismondo Ridgway, a world-class authority on ancient Greek sculpture, provides a highly informative tour of many dimensions of Greek public buildings—especially temples, tombs, and treasuries—in a text that is at once lucid, accessible, and authoritative. Ridgway's pragmatism and common sense steer us tactfully and clearly through thickets of uncertainty and scholarly disagreement. She refers to a huge number of monuments, and documents her discussions with copious and up-to-date bibliographies. This book is sure to be acknowledged at once as the standard treatment of its important topic. Brunilde Sismondo Ridgway is Rhys Carpenter Professor Emerita of the Department of Classical and Near Eastern Archaeology, Bryn Mawr College. She is the author of The Severe Style in Greek Sculpture (1970), The Archaic Style in Greek Sculpture (1977, revised edition 1993), Fifth Century Styles in Greek Sculpture (1981), Roman Copies of Greek Sculpture: The Problem of Originals (1984), Hellenistic Sculpture I: The Styles of ca. 331-200 B.C. (1990), and Fourth Century Styles in Greek Sculpture (1997).